There are a variety of different types of barcode symbols. 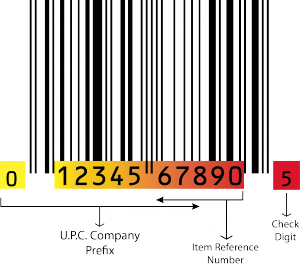 However, the UPC symbol is the most recognized barcode in the United States, since it appears on virtually every product. The UPC (Universal Product Number) symbol is the barcode representation of the GTIN-12 which consists of twelve numeric characters that uniquely identify a company’s individual product. The GTIN-12 number is part of the family of GS1 global data structures that employ 14 digits and can be encoded into various types of data carriers. Although, the initial UPC usage was focused on retail point of sale (POS), many other industries have adopted this coding structure. As of January 2005, there were significant changes to the terminology involving product barcode marking. Please visit www.gtin.info to learn more about the GTIN (Global Trade Identification Number) data structures. The first six to nine digits of a UPC are referred to as the “GS1 Company Prefix”.This number uniquely identifies a company and always remains constant on all of a company’s products. The next set of digits is called the “product numbers.” Product numbers uniquely identify individual items. Unlike the GS1 Company Prefix, product numbers are arbitrarily assigned by each company. The twelfth character is called the “check digit”. Using some form of check digit generator (use our free check digit calculator) this digit is calculated using a mathematical calculation based on the first 11 digits of the UPC code.